Hunting caribou on Adak Island combines the pursuit of one of North America's finest big-game trophies with one of the most unique hunting environments in the country. Adak caribou come from genetic stock that has the potential to produce huge antlers that would make the average hunter crazy with excitement. 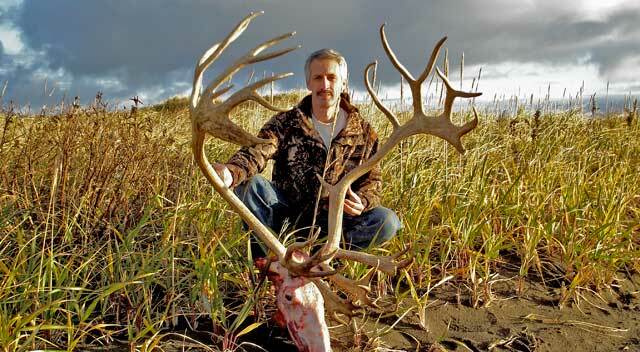 The island itself has no predators, so Adak caribou have little to do besides getting fat and growing huge antlers. To say that Adak caribou are unique is an understatement in the extreme. Barren-ground caribou were introduced to Adak Island in 1958 and 1959, in an attempt to provide an emergency food supply and recreational hunting opportunities for military personnel living there while the base was active. The original stock of barren ground caribou consisted of 77 calves taken from the Nelchina herd (GMU 13), and pen-raised on the island before being released to roam free. Only 23 of those calves survived to be released, but the population in 1999 had risen to around 1200 head. The population remained relatively stable until the base was decommissioned and military personnel evacuated from the base in the early 1990's. After the base personnel left the island, hunting pressure on the caribou herd dramatically decreased and the population exploded. In 1999, the first general season hunt was opened to the public, with no closed season and no bag limit. At that time an effort was under way to virtually eliminate all non-native species from the island, including the caribou herd. The local population of the town of Adak successfully lobbied for a reversal of this policy, and the eradication efforts have been halted for now. There are no predators on Adak, therefore caribou grow very fat and large. A large Adak caribou bull can be 20% heavier than bulls from the Nelchina herd (from which they were originally transplanted). Adak caribou spend most of the summer in the refuge, at the south end of the Island. Rental vehicles are available on Adak, but don't plan on a circle-island tour. The road system is limited to the town of Adak, a loop road that runs north of town to Clam Lagoon and over to Andrew Lake, a road to the south and west along Finger Bay, and a limited network of roads in the rolling hills above the airport, west of town. If you're planning to hunt the road system, rent a pickup so you can back-haul meat and gear to town. ATVs are a popular way of getting around, and are commonly used on the road system and to some degree off the road as well. If you plan to penetrate the island's interior with an ATV, forget it. Vehicles are prohibited south of a line from Expedition Harbor to the bay just south of Campers Point. This line is the boundary of the federal refuge. Caribou may be hunted on the refuge, but vehicles (including ATVs) are prohibited. In other words, if you're hunting south of the line, you're walking. It's roughly 8 miles from the line to the south coast. ATVs can be rented on Adak, and that's the most practical option. Various types are available, but you want to reserve yours well in advance or they could be rented out by the time you get there. A growing problem is emerging on Adak concerning habitat destruction by careless ATV riders. Stay on established trails and go later in the year after the ground is frozen to prevent further habitat loss from off-road travel. If you shoot an animal close to a trail, pack it over to the trail instead of riding off-road to the kill site. The best map out there is the Adak Island Hiking Trail Map, put together by the U.S. Navy and distributed out of the Homer, Alaska office of the U.S. Fish and Wildlife Service. To obtain a copy, contact the Aleutian Islands Unit - Homer office at 1 (907) 235-6546 and they can mail one to you. Getting around Adak on foot is of course the cheapest means of access, however care must be taken to avoid areas where unexploded ordnance exists, or other dangerous trappings from the days when Adak was a military outpost. Rommel spikes still turn up on occasion; sharpened steel spikes that are driven into the ground, that are intended to injure invading troops or to disable equipment. Though most of them have been removed, some still remain and are most often hidden under grass near coastal areas. If you find Rommel spikes, notify Adak authorities for removal. There is no tundra on Adak, and the soil is compact, though overgrown with tall grass that is, at times, up to waist height. Hiking is relatively easy, but the hills are steep and often require multiple traverses whether hiking up or down. The following chart, courtesy of the USFWS, shows the distances and estimated hiking time between popular destinations on Adak Island. There is no closed season for Adak caribou, however for most of the summer months the antlers are in velvet as they grow, and are useless from a trophy standpoint. The rut begins in mid-September and lasts into October, and because bulls ingest hormone-saturated urine from the cows at this time, the meat has a strong off-taste and is undesirable as table fare. Therefore the best times to hunt Adak caribou are in late August (assuming herds have moved to areas accessible to hunters), through the early part of September, and again from late September (after rut) into December, when the larger bulls drop their antlers. Just about any town in Alaska that is located near relatively good hunting areas sees an influx of non-local hunters every fall. To be honest, it's a mixed blessing for the locals. On one hand, we bring much-needed cash to the local economy. On the other hand, hunters can be a loud, obnoxious bunch. And they are unaware of how things are done in the village, so they may inadvertently cause problems for the locals. For starters, camouflage clothing is not necessary on Adak unless you're duck hunting. There are no trees, and you'll screen your approach to caribou using available terrain and the wind. If you simply must wear camo, stick to brown patterns, not green. In all seasons except summer, you're dealing with dead grass up to waist high, very sparse brush and some rocks. Spend some money in town. Some hunters, in an effort to save money, bring all their own food. Adak has a large supermarket with just about anything you will need, and the prices are better than you find in many small towns in Alaska. There are only a couple of places to dine out, and you might want to check those out. One is at the school. There's a small grocery / variety store there, and they serve burgers and such. There is also a bar that serves some food. If you're hunting the road system, these are great places to run into other hunters and compare notes. The fuel schedule: There is one gas station in town; it's self-serve, and it's open Monday through Friday, 8-5. It is not open on weekends. The gas station accepts all major credit / debit cards. If you're renting a vehicle (recommended) or renting local housing (also recommended), get to know the people you are renting from, and ask if you can bring them anything from town. It's expensive to ship cargo to Adak and the locals appreciate any break they can get. Clean up after yourself. Don't leave caribou carcasses or parts laying on the road (even if the animal fell there when you shot it). Do a superb job of meat salvage, and if you stay in a place that has a garage, lay a tarp down on the floor if you are cutting meat in there. Some of the places have been left a mess by hunters who left bloody animal parts in the garage for someone else to clean up. The housekeeping folks are there to change out sheets and pillowcases, not your caribou carcasses. If the place stinks from the last group, pick up a bottle of bleach at the local market and clean the garage floor thoroughly when you leave. Do the dishes and wipe down the kitchen in your housing unit, and clean the freezer of any blood that might have gotten there when you froze your meat from the hunt. Finally, take the trash to the dump! Housekeeping does not always get to your unit the day you leave the island, and whatever you left in the trash is going to stink the place up if they can't get to it right away. Adak caribou can be found just about anywhere on the island, but they do move about with the seasons. The general migration pattern is for the animals to remain in the roaded areas of the island through much of the winter months, before migrating out to the south to calve. Following the birth of their calves, they remain in the southern end of the island until mid August or slightly later. By the first week or two of September, there are usually some caribou available on the road system. Some animals really never make it to the road system at all. 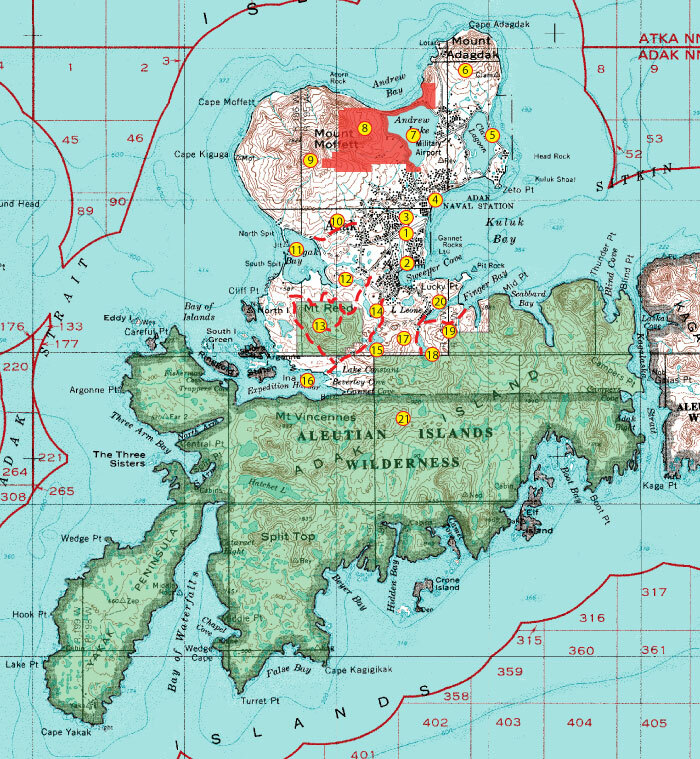 Map Notes: This is a portion of the USGS Adak 1:250,000 scale map. Docks, fish processing plant, boat launch: some fishing in this area for halibut, rockfish and greenling. Clam Lagoon outflow: scenic, some beach fishing, clamming. Unexploded Ordnance Area (UXO) Off Limits! Shagak Bay trail: Hiking trail, not suitable for ATV use due to steep sidehill terrain. Mt. Reid / unauthorized ATV trails: Mt. Reid is part of the refuge, where ATV use is prohibited. Husky Pass trail: ATV access to Expedition Harbor, however trail may be unusable due to deep mud. Federal Refuge: Motorized vehicles prohibited. The most popular time and place to hunt caribou on Adak is anywhere on the road system in the first two weeks of September. Starting in late August, caribou can be found wandering in from the south end of the island (the refuge) into the roaded portion of the island. By the first week of September, the annual migration of hunters board the aircraft for Adak, and the lobby of the airport about this time is stuffed with camo-clad Outsiders, gear bags, backpacks, and bow or rifle cases, vying for room in the terminal with hunters who are leaving, their gear pile augmented with boxes of meat and bundles of antlers. Some years the road-based hunts can become somewhat chaotic, depending on the number of hunters using the area. There are reports of hunters in the field staking claim to caribou shot by other hunters, and other activities reminiscent of opening day of deer season in some Lower 48 states. The usual tactic is to locate a vantage point and glass for herds of caribou, then make a plan to stalk them using the prevailing wind and terrain to screen your approach. If you're up for a walk, you can get away from some of the pressure by walking in toward the Lake Betty area, or the slopes of Mount Moffett. Two points of note on the east side of the island are Caribou Peninsula and Yakak Peninsula. Caribou tend to wander out onto both peninsulas, but both are joined to the island by narrow necks of land that form choke points where caribou can be intercepted. Public use cabins are located in both places. The first one, Unalga Bight Cabin, is accessed overland by taking either of two hiking trails off the road system, to Expedition Harbor. The first trail starts at the end of the road near Lake De Marie, and the second starts at the end of the road in Finger Bay. Both trails take you to Lake Constance and Bereflag Cove on Expedition Harbor. From that point take an inflatable canoe or kayak to Unalga Bight, roughly four miles distant, on the southeast shore. The cabin is on the left-hand side. Winds can be quite ferocious in this area, making launching hazardous or impossible. Also, winds out of the south can blow your boat offshore, making it impossible to get to shore. Hug the shoreline and be prepared to beach your boat and take shelter quickly if the winds rise. If you are blown offshore, you may be able to land on the lee of any of several islands farther out toward the mouth of the Bay of Islands. The second of the two choke points is named "Slaughter Alley", and is located where Yakak Peninsula joins the island. The Three Arm Bay public use cabin sits in this location and forms a good base of operations for hunts in this area. Getting there is the real challenge, however. An overland hike is prohibitively long, and there is no trail. ATV use is prohibited in the refuge, so vehicle access is not possible. The only viable option is a boat-based drop-off from the town of Adak. But the journey is long and completely exposed to the weather. Do not put all your eggs in this basket. If you plan to hunt out of the Three Arm Bay cabin, you also need a backup plan in case the weather goes down. Remember that it could be doable when you are dropped off, but it could go down while you are afield, making a pickup impossible for many days. It should be noted that any public-use cabins on the entire island are not necessarily maintained. It is not recommended that you hike long distances to any of these cabins, without alternative shelter with you (such as a solid, four-season mountaineering tent). Always have a backup plan in case the cabin is in poor condition. The area bordered by Lake Betty to the north, Expedition Harbor to the west, Beyer Bay to the south and Boot Bay to the east is characterized by rolling hills and small lakes. Like similar areas on the island, the hills can be steep and slick, especially when the grass is wet. This area offers appropriate cover for rifle hunters, however archers will need to make special use of the terrain to shield their approach to animals in the low rolling hills. There are some taller mountains just southeast of Expedition Harbor that offer good stalking opportunities. The area around Hatchet Lake offers similar advantages, as do the small mountains to the south. Over toward Boot Bay, there are some higher hills that offer elevated glassing opportunities and the terrain, though not as convoluted as the area between Hatchet Lake and Expedition Harbor, offers stalking opportunities. Bordered by the Yakak Peninsula on the west, and Boot Bay on the east, the southern shores of Adak Island are without question the most remote reaches of the island and, as a result, see very few hunters in a given season. ATV use in this area is prohibited, and the distance over exposed seas is too great for reliable boat drop-offs and pick-ups. Bush plane access does not exist, so the only reliable means of accessing this area is by foot. Considering that it's over seven miles from Expedition Harbor to the south coast over very rough ground, foot access to the area is no small task. Unlike most of the state of Alaska, Adak Island has no predators. This means that hunters don't have to worry about a bear or a fox finding their game meat while they pack it to camp (Adak caribou are unusually large-bodied and in most cases cannot be packed out in one load). On the other hand, the island has a superabundance of bald eagles, and unless precautions are taken, they will find the kill and contaminate the meat with feces as they eat it. Meat must be covered carefully, and camouflaged with grass. If you are staying in one of the bunkers, you can hang the meat on a frame made of scrap wood. It is likely you will have to scrounge for materials. Avoid laying meat on the floor, even on a tarp. Adak has a prolific rat population and you could attract visitors. If you are staying in one of the local rental houses, you may hang your meat in the garage. Place a tarp under the meat, so blood does not drip onto the floor. Avoid the temptation to haul whole carcasses to your rental unit with plans to gut and skin them indoors. Past experience has shown that some hunters fail to clean up the mess afterwards and many of the garages in the rental units reek of dead meat. Process your animal in the field and save the detail work for just before the trip home. If you opt to bone out the meat before your return flight, do so on a tarp, and haul the bones and scraps to the dump. Leave nothing in the garage of the house you are renting. Haul all your trash away to the dump, including bloody tarps and such. Aleut Enterprise, a website operated by the Aleut Corporation, one of the largest private land holders on the island. The site is mostly devoted to customers interested in purchasing bulk fuel. Adak Update, an informational site operated by the U.S. Navy containing videos, photographs and other materials related to unexploded munitions on Adak, as well as cleanup efforts related to the 50-plus years that Adak was a military base. U.S. Fish & Wildlife Service operates a site of interest to hunters and fishermen.